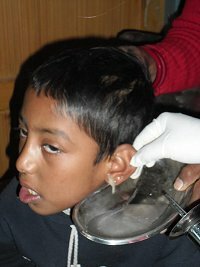 Today one small boy came from a very remote area for checkup of his ears because he was not able to hear since birth. But when I check with ear, I saw a big thing inside his ear completely blocking his eardrum … then I started syringing and came out big white thing. So later he was listening well when we were talking. Because of his ear blockage, he was deaf and very weak at study. His mother was so happy now his son was hearing so that today our Hope team all are very happy too. So we thought today is our Happy Christmas day for me and all staff ha ha.So poor life because unable to pay for a check up.